The original plan for this walk was to be a linear walk from Piercebridge to Richmond but plans had to be modified when we decided to use one car. The consequence of this was that we found ourselves in Eppleby Village with a plan to look at Stanwick Camp on a circular walk. There is easy parking at Eppleby on the roadside as the road is quiet. The walk started badly with a navigation problem. We generally have a poor opinion of the waymarking in North Yorkshire and indeed there is a problem here. At the south end of the village shortly before the last houses on the right heading south is a footpath sign. Look carefully as a few yards away there is another one on the opposite side of the track leading into a field. The OS map indicates that the path heads south but following this brings you to Forcett Beck where there is no bridge. Looking round you can see if instead you had gone across the field and headed south east towards the farm houses, some of which look like holiday accommodation, you will note a bridge which can be crossed. After crossing now head south to climb the embankment of the old railway, opened as long ago as 1866, which carried limestone from Forcett Quarry which is passed later in the walk, then head on the embankment to the right in a south west direction for about 100 yards to a stile on the left. Cross the stile and follow the path south alongside a hedge through horse land to pass the buildings to the left to arrive at a tarmac road at the east end of the village of Forcett. 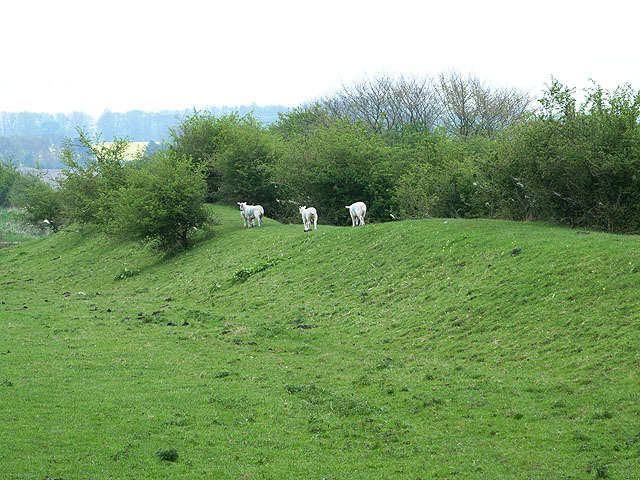 Immediately on your left is a big embankment and this is part of the fortifications of the famous Stanwick Camp. In this area are nearly six miles of ramps and fortifications which can be seen on examining the landscape. In some places these fortifications can be sixteen feet high. Nearby information boards give additional information on this fine site which is one of the largest Iron Age fortifications in the UK. The name Stanwick is thought to derive from stone wall settlement and this whole site was the headquarters of the Brigantes in the early days of Roman occupation. They appear to have been on relatively easy terms with the Romans and much work was done on this topic by Sir Mortimer Wheeler in the 1950s. Head eastwards along the road for about 200 yards and take a path in the field on your right. On the ground this path is easier to follow round the field edges, where there is also horse traffic, to a stile in the south east corner and then follow the path with appropriate instructions to miss a wet section to reach the church of St John the Baptist of Stanwick St John, which is entered by a stile. This is a 13th century church built on the site of a Saxon church and then modified and rebuilt by Anthony Salvin in 1868. This architect is met on other walks near to his home base near Durham city. The church is a Grade 1 Listed Building by English Heritage and is situated within the earthworks of Stanwick Camp. It is currently closed for regular worship and is maintained by the Redundant Churches Trust who do a superb job here on both the buildings and the grounds. Leave the church by the main gate and cross over Kirk Bridge and then take the path east along the river bank accessed by a difficult ladder. You soon cross over to the other bank and follow the clear track all the way to Aldbrough St John which deserves some of your time. This is a spacious village with large greens and seats as well as a good pub open at lunchtime. 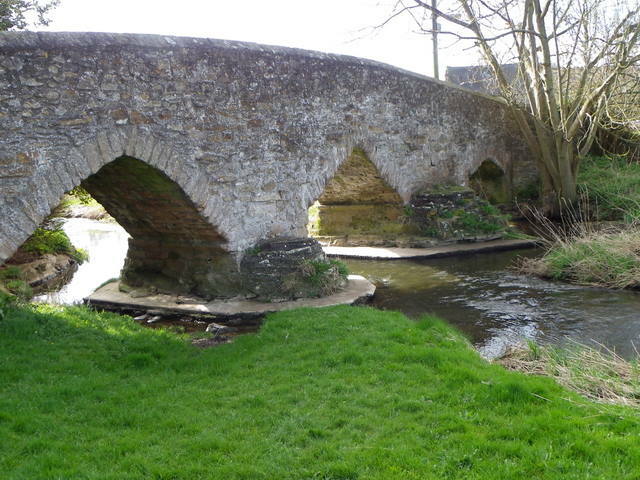 Particularly noteworthy is the fine three-arched pack horse bridge with a span of forty eight feet. The bridge has parapets but there are indications that the original bridge has kerbs of six inches. The bridge was on a pack horse route linking Tyneside to Lancaster, going westwards from here to Marske, Hawes and Ingleton. Leave Aldbrough to the south west on a minor road to Park House and follow the Scots Dyke through Langdale to a tarmac road which is the access road to High Langdale. Here turn left along the road until you reach a stile on your right and a clear path heading up the field. This is not as shown on my map but is obviously a legal diversion which makes less use of the field. There are clear waymarks and good stiles to West Lane and there is the option of looking into Melsonby. Now comes two miles or road walking on West Lane and and then passing Carkin Grange to Limekiln Plantation where you turn left on Brick Kiln Lane and pass through Tile Sheds Farm. The products of the Tile Sheds are evident everywhere here with the red pantile roofs reminiscent of Southern France. In over an hour here we were only passed by three vehicles. 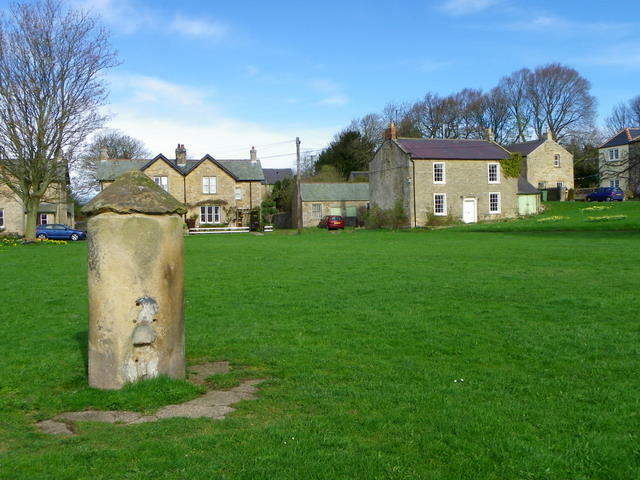 Now head west to East Layton passing St Cuthbert’s Church and also the Palladian Country House of Forcett Hall on your right. At Hall Farm head north on the road to Forcett Quarry which has been supplying limestone to industry in the area for over 150 years. The way to the west of the quarry arrives at New House where the footpath heads diagonally across a field to a gate. Virtually opposite is the access road to Layton Fields Farm where there is a diversion to keep walkers away from cattle. A sensible diversion in an attractive area. The way is clear following waymarks and stiles under Foxberry to the village of Caldwell where there is a very good gastro pub also serving good ale. Note the dovecot and the fountain at Caldwell. The path to Eppleby is well marked at Caldwell and crosses open access which is Caldwell Common. Towards Eppleby the situation deteriorates at GR 170135 where some hedges have been taken out to enlarge a field but if you head due east you will pick out the route with little problem where the path joins one from the north to cross a small stream and from then on it is good going back to the village of Eppleby, coming out near the shop and coffee rooms. A new waymark in an enlarged field near to the pylon would be very useful! This is quite a good walk if you are wanting to stride out and is generally good underfoot, in quiet countryside, free from commercialism. This entry was posted on Wednesday, September 16th, 2015 at 1:27 pm	and is filed under Other.